How do you improve on a unproduced masterpiece? Make it even more refined... and a reality. A few weeks ago, I wrote about the "greatest game gadget that never was": Alex Bahr's SD Card reader for Game Boy Camera, which answered the frustrating question of "how do I get all my low-rez photos off the camera"? 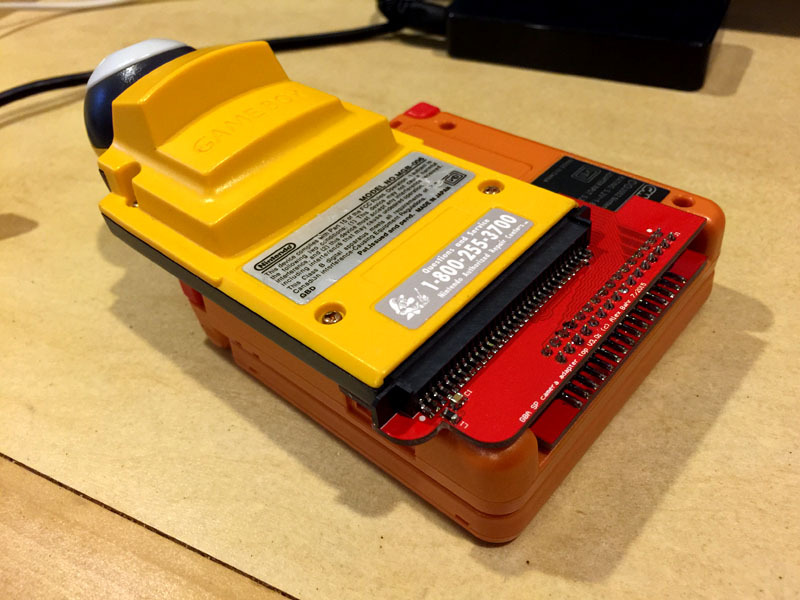 His solution: Subvert the Game Boy Printer "print" function to save photo data to an SD card. It's a simple and effective, if admittedly somewhat slower than dumping your entire iPhone library to iPhoto in a single swoop. After all, you still have to print one image at a time. Nevertheless, it's hard to complain when the only other process involved long-obsolete software for forgotten version of Windows and computer ports few PCs even have these days. I used Bahr's invention at E3 with amusing results. 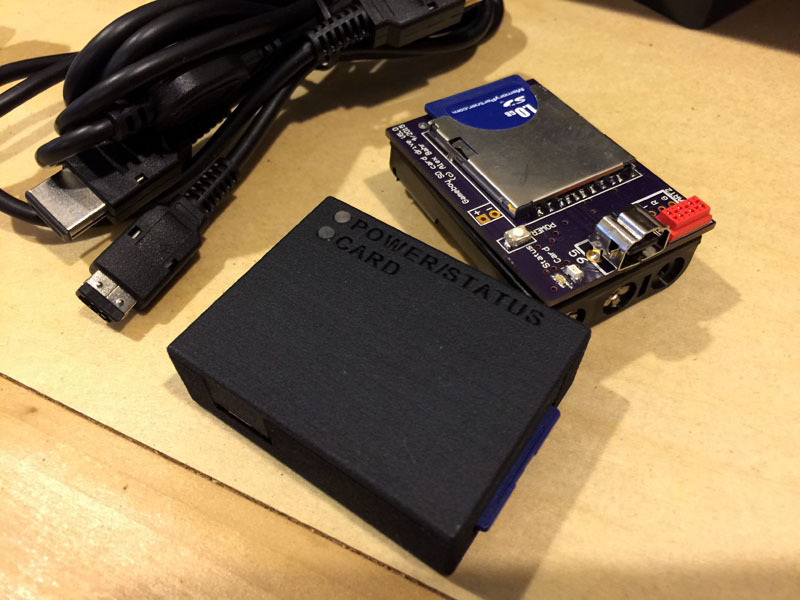 Our look at the SD card reader resulted in a few positive responses. One USgamer reader contacted me to let me know that he'd been looking for a way to get a snapshot of his father — one of the last ever taken of him — off his GB Camera for posterity, and reading about this gadget galvanized him to finally get it printed out. Perhaps less heartwarming, but definitely just as upbeat, is Bahr's news that he'll be working with gameboyphoto to produce a run of the SD card reader, now called BitBoy, at some point in the near future. Bahr also went ahead and created a 3D-printed case for the device so that it's no longer a pair of bare circuitboards, and also replaced the AAA batteries with an integral LiON charged via micro USB. Old and new: The original GBC SD card reader sits behind the BitBoy. There was, however, one last inconvenience I encountered as I traveled through the darkened halls of E3 trying to perform Game Boy photography: It's tough to find a solution to allow you to see the screen when shooting with Game Boy Camera. I ended using a Game Boy Light, an expensive Japan-only version of Game Boy Pocket that used "indiglow" side-lighting to provide dim blue illumination for games, but given how hard GBLs are to track down for less than $100, it doesn't seem the optimal solution. 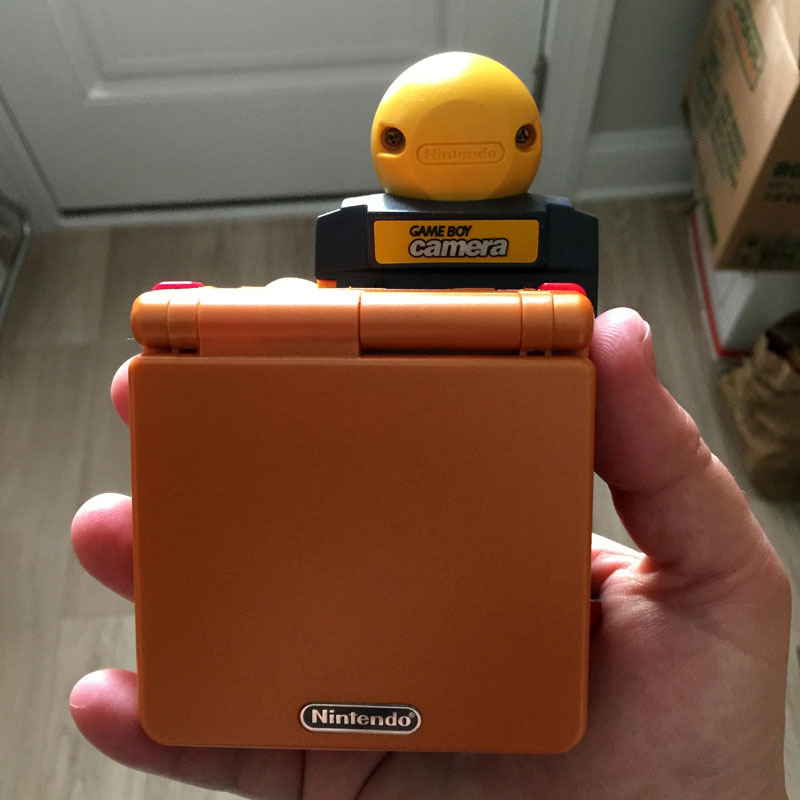 Ideally, you'd want to use a Game Boy Camera with a Game Boy Advance SP, the last device Nintendo ever manufactured that offered direct compatibility with original Game Boy software like the Camera. The final GBA SP model, the AGS-101, offers a screen even brighter than the 3DS XL; Game Boy software looks incredible on it. Unfortunately, the SP was engineered with an upside-down cartridge slot. Now, you can toggle the camera's orientation within software, so it's usable... but even so, the camera sensor is placed awkwardly on the SP, sitting below the device instead of on top at eye level as it was designed to do on other Game Boy devices. 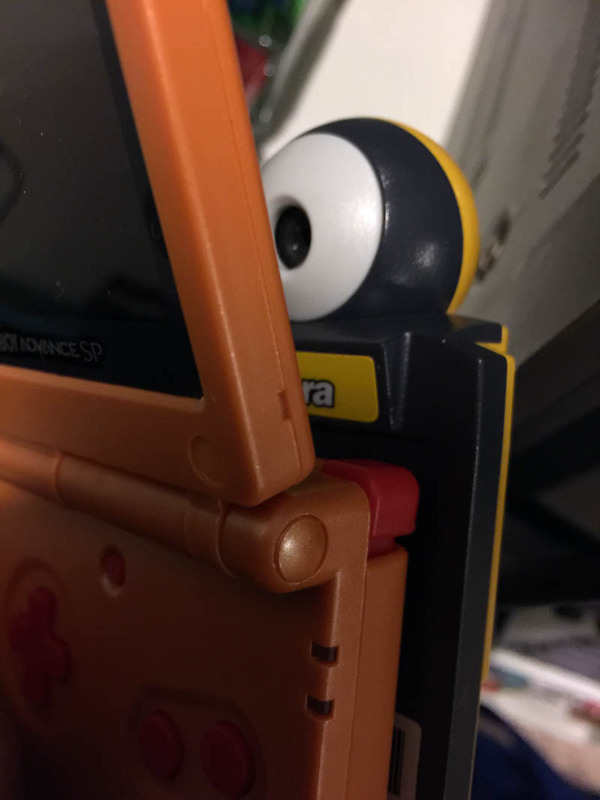 Happily, Bahr sent along a solution for that, too: A small adapter that plugs into the SP's cartridge slot and creates a bridge that allows the GB Camera to sit flush against the back of the system, with its sensor at the proper height. This is basically the third phase form of the final boss of Game Boys. While it's possible to do this with a GameShark, that's a less elegant solution than Bahr's: The cheat device is bulkier, and it has its own startup menu. This adapter adds no extra steps, so you can jump immediately to the Camera software. All in all, it's a basically flawless solution: A compact, convenient way to shoot with Game Boy Camera on a bright, beautifully clear screen. And a quick and easy way to get those images onto a computer as a means to jockey for position as the ultimate video game hipster on social media. 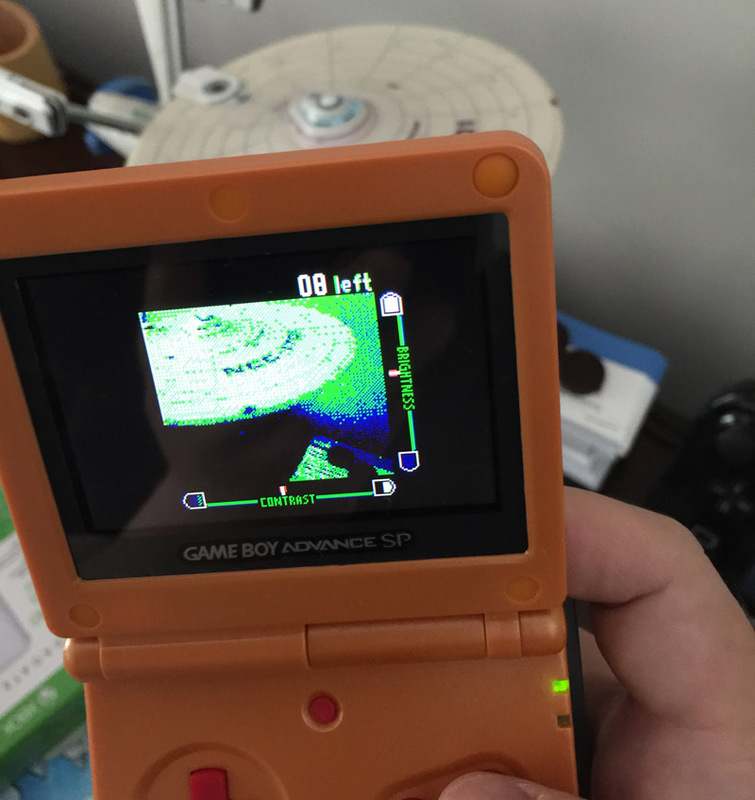 Bahr has conquered the final frontier of Game Boy photography. In fact, I can only think of a single shortcoming for Bahr's inventions: The flip-up screen of the GBA SP makes Game Boy Camera selfies impossible. Sorry, you'll just have to make do with Christine Love's Interstellar Selfie Station. Personally, I'm looking forward to these gadgets making their way into the world and once again popularizing the abstract art of Game Boy photography for the gaming masses. It'll be nice to be one of many instead of the lone weirdo taking photos of Microsoft's E3 booth with a Game Boy. In the meantime, I'm looking forward to conquering the next Game Boy Camera challenge: How to use it as a portable video camera. I figure if I plug it into a portable Super NES clone system via Super Game Boy and run the video-out cable into a compact digital camera it would work... and I could be the first person ever to shoot a feature-length film entirely on Game Boy. Ah, to dream a dream. The Kardashian generation does NOT approve. Thanks to Alexander Bahr for providing the equipment for this feature. Tagged with alexander bahr,	Articles,	Game Boy,	game boy camera,	Nintendo. A little color should brighten SR388 right up (oh God it didn't work)! Why Didn't The Legend of Zelda: Link's Awakening Switch Remake Follow in the Footsteps of A Link Between Worlds?